The air we breathe can be contaminated by emissions from motor vehicles, industry, heating and commercial sources (outdoor), as well as tobacco smoke and household fuels (indoor). In the WHO European Region alone, exposure to particulate matter (PM) decreases the life expectancy of every person by an average of almost 1 year, mostly due to increased risk of cardiovascular and respiratory diseases, and lung cancer. Furthermore , a recent study using data from 25 cities in the European Union has estimated that life expectancy could be increased by up to approximately 22 months in the most polluted cities if the long-term PM2.5 concentration was reduced to the WHO guideline annual level. Data from the WHO Environment and Health Information System (ENHIS), covering 357 European cities in 33 countries, show that in 2009 almost 83% of the population in these cities was exposed to PM10 levels exceeding the WHO guidelines. While this proportion was still high, it represents an improvement compared to previous years, as average PM10 levels slowly decreased in most countries in the last decade. Some 40 million people in the 115 largest cities in the European Union (EU) are exposed to air exceeding WHO air quality guideline values for at least one pollutant. Children living near roads with heavy-duty vehicle traffic have twice the risk of respiratory problems as those living near less congested streets. 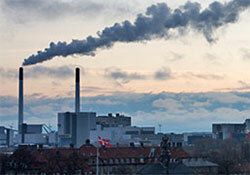 Indirect effects of air pollution, such as climate change, are becoming increasingly evident. Transport is the fastest growing source of fossil-fuel emissions of carbon dioxide (CO2), the largest contributor to climate change. Ozone pollution causes breathing difficulties, triggers asthma symptoms, causes lung and heart diseases, and according to statistics is associated with about 21 000 premature deaths per year in the Region. Indoor air pollution from biological agents in indoor air related to damp and mould increases the risk of respiratory disease in children and adults by 50%. Second-hand smoke causes severe respiratory health problems in children such as asthma and reduced lung function. It also causes lung disease, cardiovascular diseases, cancer and premature death in adults.